Tracy is a bachelor graduate from China. She’s planning on applying for several master’s programs from some top Australian universities. She’s got plenty of materials—degree certificates, official transcripts, and language testing reports—that prove she meets the requirements of the Australian program. Each material must be attached to a third-party certificate to verify it’s authenticity, and these certificates must be issued by recognised agencies. The whole process is time-consuming and expensive. When Tracy got her bachelor’s degree from a Chinese university, she received a paper certificate—but her university uploaded a digital copy and official transcript onto China’s National Higher Education Information Database. Since Australian universities and RTOs can't access this database, it becomes difficult for them to verify whether Tracy's paper document is genuine. Training organisations can’t trust everyone to be honest, especially when fabricating a paper certificate is so easy and cheap. In fact, academic fraud is a severe problem around the world. According to a survey from Hireright, a background screening company based in America, 86% of respondents reported that they found lies and misrepresentations on resumes. George Gollin, a UIUC physics professor, also did an investigation and implied that over 200,000 fake degrees are sold in America each year. Many edtech experts see blockchain as the answer. Retrospective: Each record is added into a block, and these blocks are linked in a time-based chain by certain cryptologic algorithms. Consequently, everyone can follow this chain to trace the whole history, meaning all modifications are recorded. 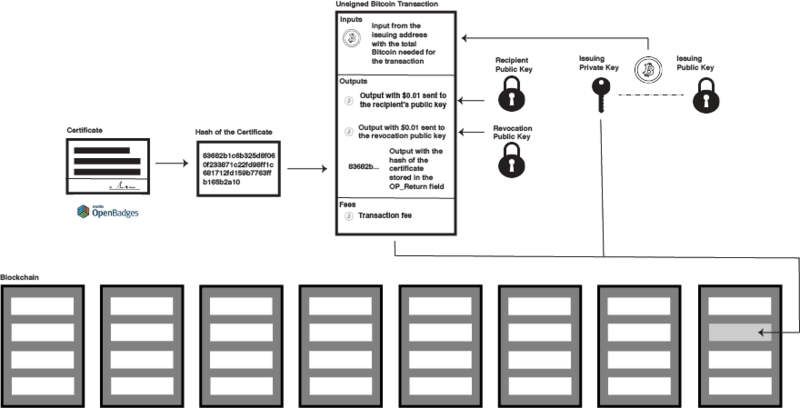 Safe & Immutable: Data stored in a blockchain cannot be modified. Although, the cannot doesn't mean it’s not possible—but it would be extremely hard and incredibly costly, which counters any incentive gained from hacking it. Decentralised: A blockchain refers to a distributed network composed by everyone who participates; democracy is one of its natural attributes. To apply any modification, it needs more than half of the participants to be in agreement, so no one can unjustly overtake the others. Recoverable: Data is stored in a physically-distributed network. Each participant in the network has access to a complete record (or ledger). So even if some participants' data is wiped simultaneously, once they reconnect to the network they’ll get the latest copy immediately. We have a new digital certification infrastructure in place which contains a complete record of our academic achievements and learning accomplishments. The decentralisation of this infrastructure develops a highly open and trusted network within higher education institutions and the RTO community. The system’s immutability guarantees all records are first-hand and validated. Even if the original record is fraudulent, retrospect makes auditing easy and the network can rapidly figure out who did it. And if the network is running, users never have to worry that the data will disappear incidentally. This system allows us to share a digital qualification with employers while giving them complete trust that the certificate is legitimate. It’s a tremendous leap that has reformed how people recognise learning. This imaginary world where education credential security is fuelled by blockchain could soon become reality—the problem is, we’re still hooked on our traditional academic system. And the cost of this is not just our money, but also our time. Every year, Australian universities and RTOs invest in building and maintaining an information management system to handle, store, and manage hundreds and thousands of applications from all over the world. It’s one of their main expenses. But when these existing certification systems aren’t working well, the consequences are serious: like the cumbersome and expensive process of requesting a university transcript, or when a learner is prevented from further study because they can’t provide a stamped certificate. Blockchain-based digital systems could eradicate both of these issues. In recent years, various MOOCs and elearning tools have risen as an alternative study option, mainly due to their flexibility and affordability. When the world moves faster and faster, lifelong learning is not going to be a pretty manifesto, but a must-do necessity. The modern learner has to balance their time between their career and personal development. Consequently, learners will prefer a course experience which is agile and achievable. That’s why Udacity, an emerging player within the MOOC community, achieves a 23.08% completion rate with their Nanodegree certifications—which is considerably greater than Coursera's 4%. When we consider the reasons why a learner is willing to spend their spare time acquiring new knowledge and skills, “solving problems at work” and “up-skilling” are two main objectives. A 3-month self-paced Advanced Google Analytics Certificate with an accredited real-world qualification is more relevant than a 3-year off-work comprehensive study in the marketing sector of a business school. Changing trends and learner needs have led to industry calls for the implementation of an open micro-credentials system. Associated with other upcoming technologies, like Tin Can API and Open Badge, this future elearning system would track learners’ study steps and issue a badge automatically once they finish a section and meet the requirements. But how can we make sure these records are validated or issued by an authoritative organisation? The industry needs a reliable, open platform built on a blockchain for storing and managing digital certificates and reputation. The above table comes from a Gartner report which demonstrates how long it could take for these emerging technologies to become mainstream. In their prediction, AI, big data, blockchain, open micro-credentials, and Tin Can API will go to the real world in tandem. 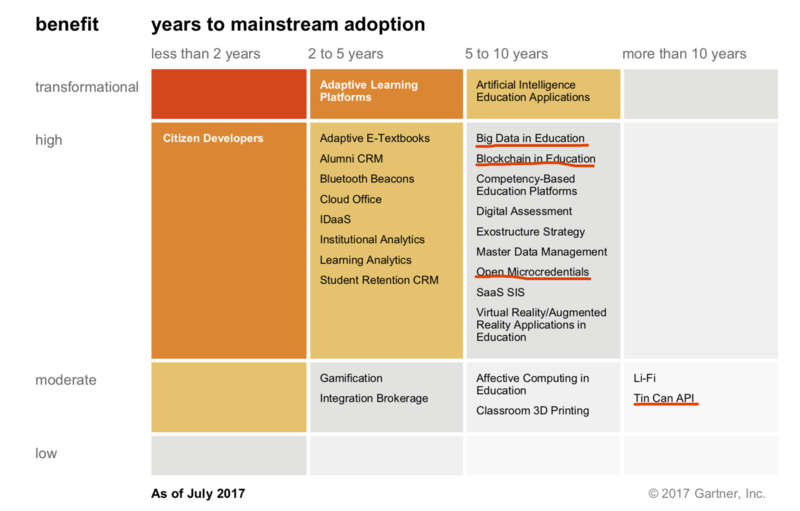 According to the report, the new generation of education infrastructure will be a blockchain-powered service, which will empower a brand new way to achieve certifications. 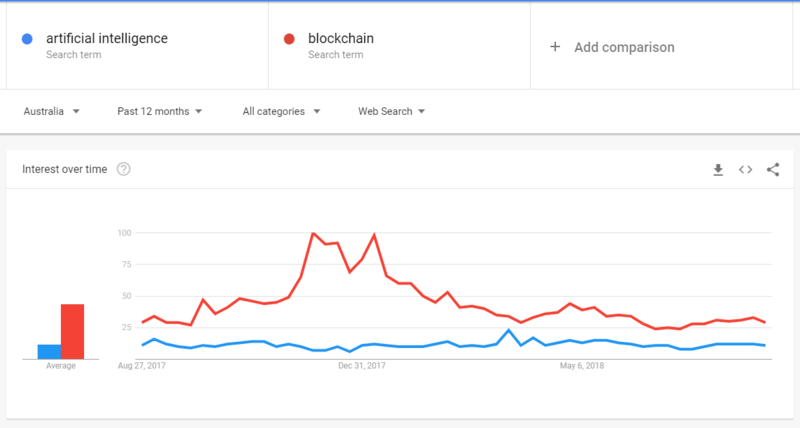 This figure shows an Australian Google search trends comparison between artificial intelligence (blue) and blockchain (red). Most of us are familiar with the hype around the hot topic of artificial intelligence—but what about blockchain? This above graph shows the Google search trend of the phrases ‘artificial intelligence’ and ‘blockchain’ in Australia in the past 12 months. Since the boom of cryptocurrency in 2017, the blockchain has become the modern equivalent of the tulip in 1630s Holland. Although the subsequent bust ruined the economy of the Netherlands at the time—and cryptocurrency will experience a similar bust—when the Dutch recovered from tulip mania, they gained the biggest flower industry in the world. Blockchain is still embryonic. A Gartner report indicated that this technology would need 5-10 years to stand in maturity and reach mainstream adoption—but this is actually good news. Because we already know that a revolution is coming we have the opportunity to prepare, and avoid being submerged in the torrent of history.